Red Thera-Band Exercise Band - 5.5m. This 5.5m long Red coloured Thera-Band Exercise Band offers a level of resistance that is rated as medium, and can be cut to individual lengths as required by the user. 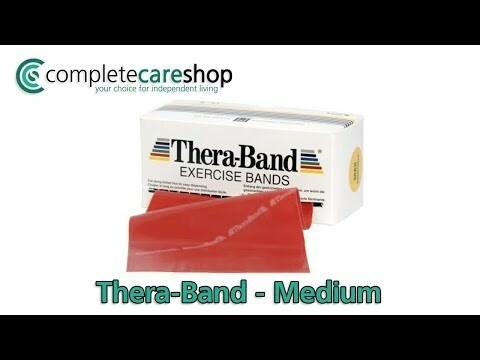 Thera-Band latex Exercise Bands are available in a range 8 colour-coded levels of resistance and in 2 different lengths, all of which are available in this section pf our shop. Proper use of the Thera-Band system for resistive exercise provides the user with both positive and negative force on the muscles, improving strength, range of motion and cooperation of muscle groups. The colour-coded progressive resistance levels, allows clear, structured and visual documentation of progress from one level to the next.